"The Importance of Being Earnest" was written in 1895, five years before the author's death. It was fresh then. But it is 2013. Victorian society has become an easy target, even when set on Carnaby Street in the mod 1960s, so we would have loved to see Paul Gordon and Jay Gruska, the songwriting team with a pedigree for taking classical stories and turning them into musicals, try a different approach then one familiar English cliché after another. 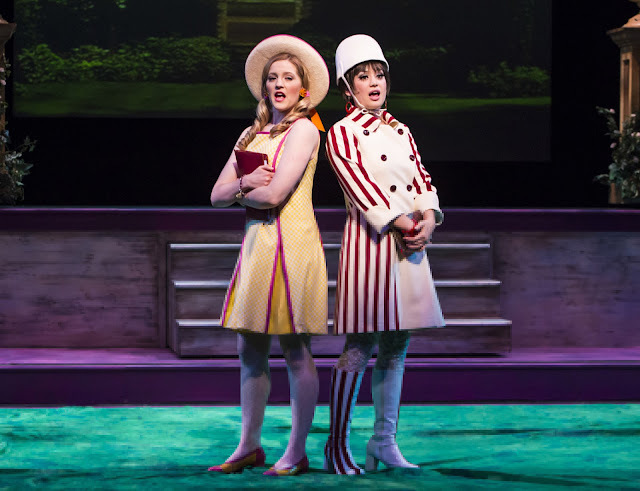 The World Premiere of Gordon and Gruska's "Being Earnest" has some cute songs and funny moments, but that's about it. 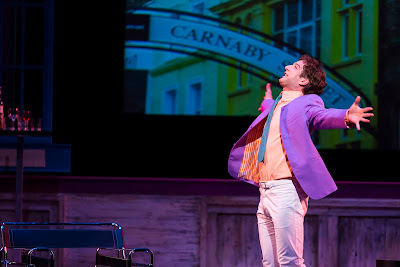 Euan Morton and Hayden Tee, as the two would-be Earnests, are fine singers, as are Mindy Lym as Gwendolen Fairfax and Riley Krull as Cecily Cardew. But the songs are one-trick ponies, one jumpy and witty tune after another. 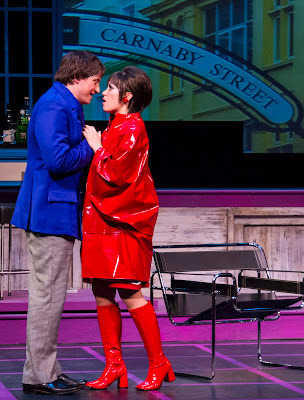 There are two standouts: "Brothers," the show's featured song, which is repeated throughout the show with changed lyrics, and "Cecily," sung by Morton in Act One. 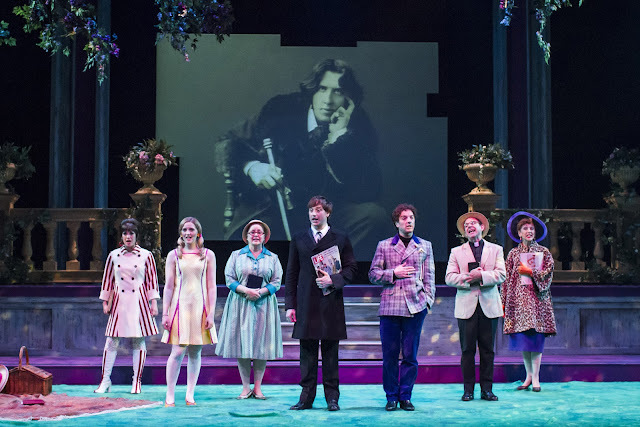 "Being Earnest" is well constructed, acted and directed. It will bring a smile to your face. Just don't look for too much more. The San Francisco Theater Blog Awards Division awards "The Importance of Being Earnest" Three Stars with a BANGLE OF PRAISE. If you love Oscar Wilde, you'll enjoy a familiar, entertaining evening of thee-a-tah. The BANGLE goes to Costume Designer Fumiko Bielefeldt for Gwendolen's Carnaby Street dress and matching boots, plus the white hat. When you call up a single memory of this production, it's going to be this dress. Liam Craig is a great actor. He plays Walter Wells as if he has climbed inside his skin. 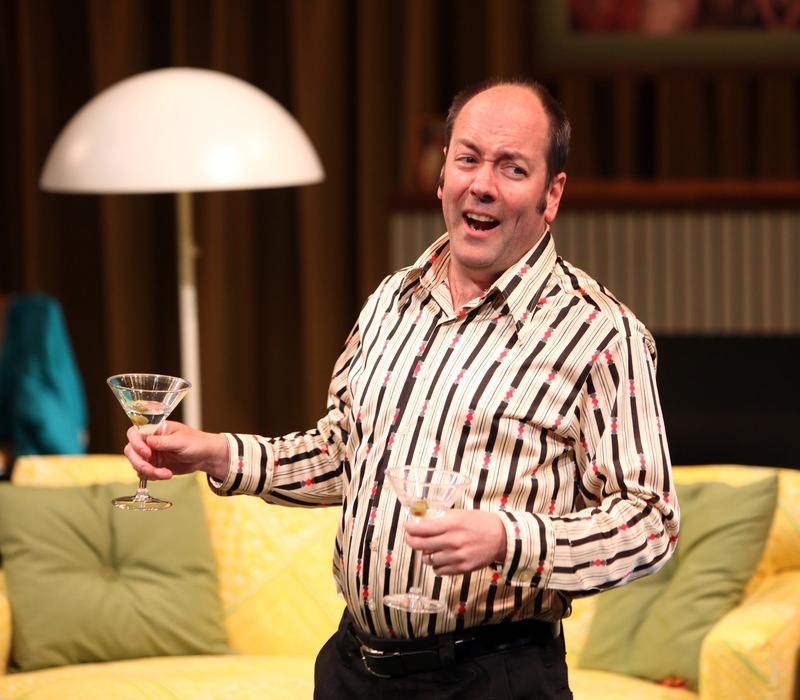 At the start of the play, Wells proclaims that he, his wife and two kids, and his close friend Reverend Gary Stuart (Gabriel Marin) have the perfect lives. These Southern Californians are indeed the happy ones. But then the phone rings and Walter's world is turned upside down. For the rest of the play we see him attempting to climb out of an enormous emotional hole and he goes about it with class. Craig and author Julie Marie Myatt give Walter what we almost never see anymore -- a suburbanite with a soul. Walter's life has been challenged, but he is determined to get through it on terms that he and we can applaud. Gabe Marin's Gary is the world's worst clergyman and he knows it. 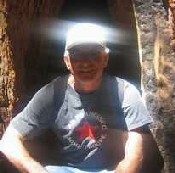 The pastor of the Universalist Unitarian Church, he is a wandering soul fatally attracted to divorcee Mary-Ellen Hughes (Marcia Pizzo). Gary and Mary-Ellen try to comfort Walter, but their efforts are as clumsy as everyone else's. We can safely tell you there is death involved, but this is not a story about death. When they wheel in Bao Ngo, played by the amazing Jomar Tagatac, a touching story begins, where anguish and mistrust lead slowly to friendship. We cannot give Tagatac enough credit. His suffering has enveloped him, but he maintains a restraint that would, with a lesser actor, come across as unreal. Liam Craig's character drives the show, but Bao Ngo is the one we cannot forget. Director Jonathan Moscone, and Scenic Designer Erik Flatmo have developed a pinpoint choreography with the stage crew to make many scene and prop changes occur flawlessly on the Magic's small stage. It's like a show within a show -- and they have to do it with the lights out. There are memorable quotes, but they're all spoilers so we're not going to give you any. 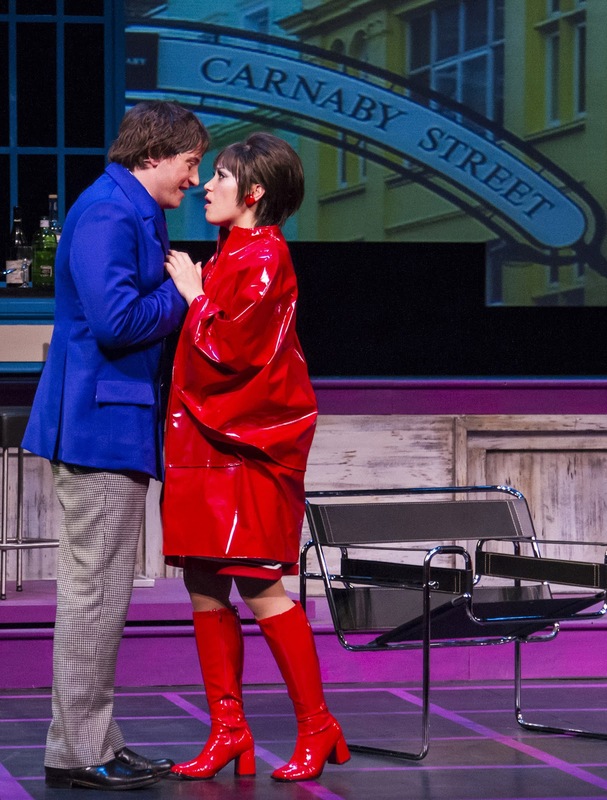 "The Happy Ones" is one of the best shows we've seen this year and you won't want to miss it. 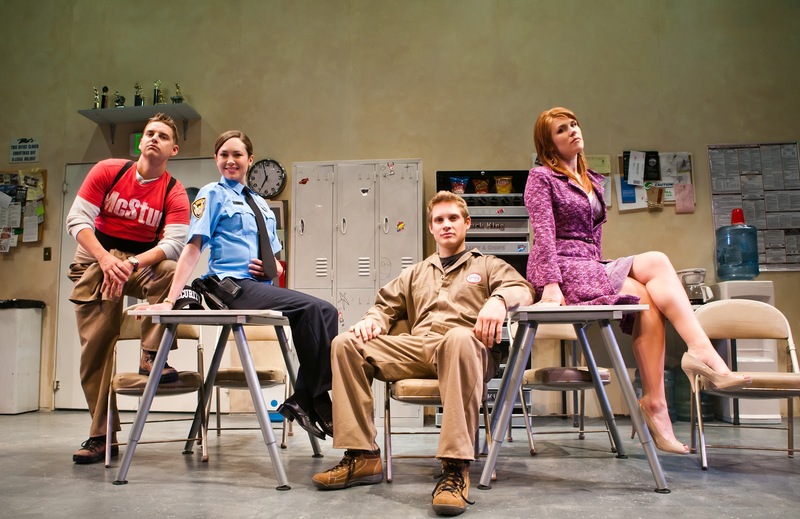 The San Francisco Theater Blog Awards Division awards "The Happy Ones" Four Stars. 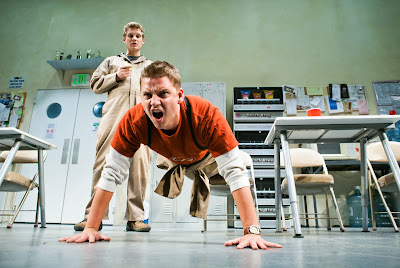 Acting, Directing, Staging and Writing all merit a full star each. We love how the plot turns with a big surprise in Act One, and we then set out on a great ride through to the end of Act Two, when the author pays us off and thanks us for our efforts. 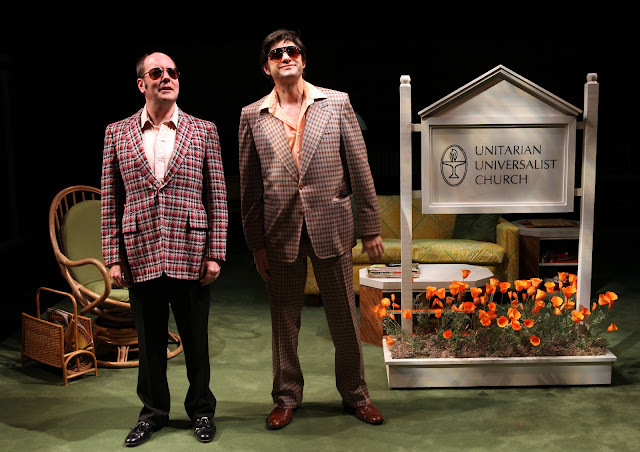 It is also nice, as Producing Artistic Loretta Greco says at the outset, to have "a strange thing happen in the middle of the play: people get up and leave the theater. This is called an intermission." Intermissions are becoming as rare as lengthy attention spans in today's theater, often with good reason. Not here. We've got a lot to think about. Lauren English (Steph) has The Stare. Greg (Craig Marker) can't stand up to it. Few can. At the same time, one of Kurt Vonnegut's rules for writing good short stories is to always give your reader at least one character to root for. Perhaps this is the heart of our problem with Neil LaBute's "Reasons to Be Pretty." The Stare notwithstanding, LaBute has not given us anyone we feel like cheering. The four person ensemble works hard. 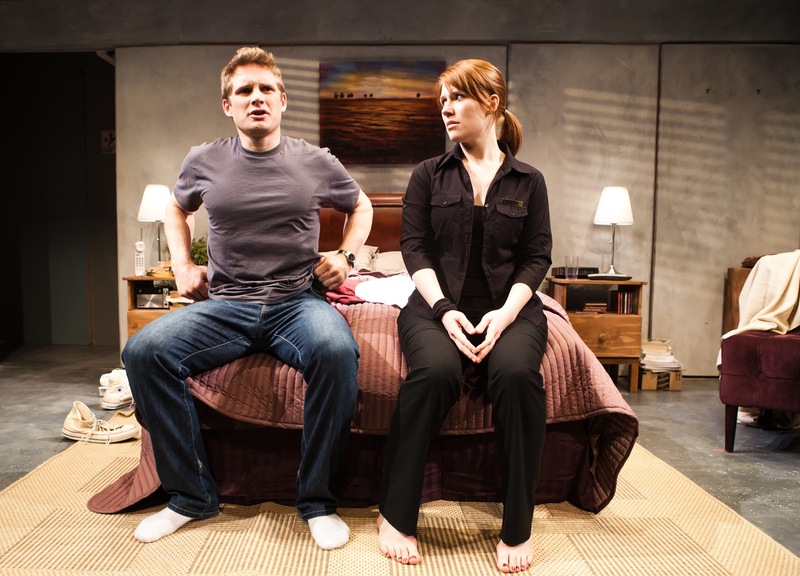 Steph and Kent (Patrick Russell) get to throw spectacular temper tantrums. In fact, Steph does it twice. But we are asked to make sense out of her nuclear meltdown anger at her boy friend Greg for saying something that appears to have been, at worst, a silly comment by a silly boy. We are asked to have sympathy for Steph's friend Carly, the security guard (Jennifer Stuckert), who is a uniformed and uninformed shrew. Most of all, we have to keep putting off our strong desire to grasp Greg by his shoulders and shake him until he lets the air out of Kent's tires and change cities. 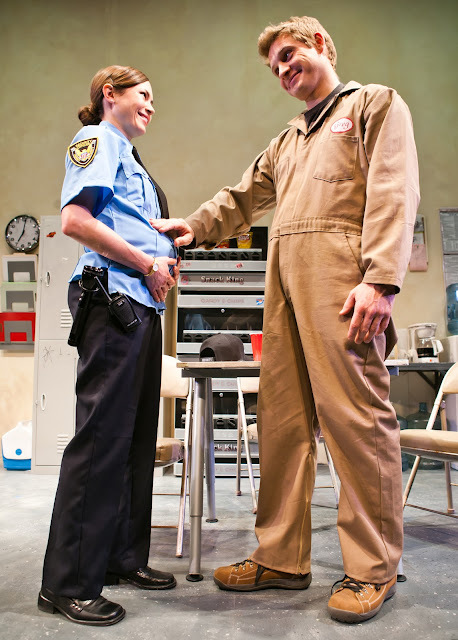 In the terrific "Fat Pig," another work in LaBute's trilogy that deals with human foibles about personal beauty, we saw something vicious and uncomfortable. The author was angry. 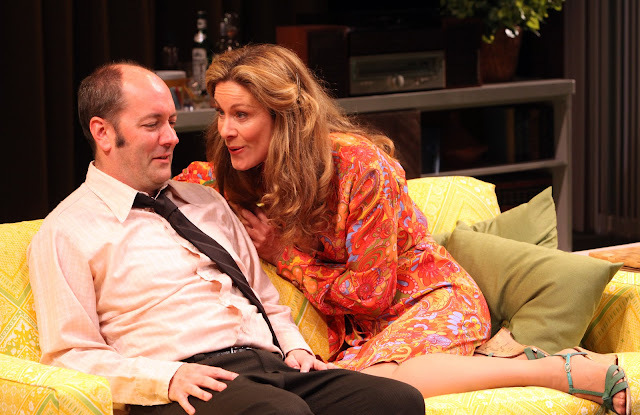 Here, though we like the acting and director Susi Damilano paces the show well, LaBute feels distant. Instead of venting he is lampooning. FULL DISCLOSURE: A man is writing this column. He may be clueless. His wife thinks so. She says she knows why Steph reacts as strongly as she does. This puts her husband in a difficult position. He says he would never say something as stupid as what Greg said about Steph. He gets The Stare. The San Francisco Theater Blog Awards Division awards "Reasons to Be Pretty" Three Stars. It's all in the writing -- we want to know sooner why Steph goes so over the top, which is crucial to liking or being confused by the show. We have no idea until the end, and the final scene lasts a long time. Bill English's set is spectacular -- you walk into the theater and run right into the wall of a giant white lunchroom. 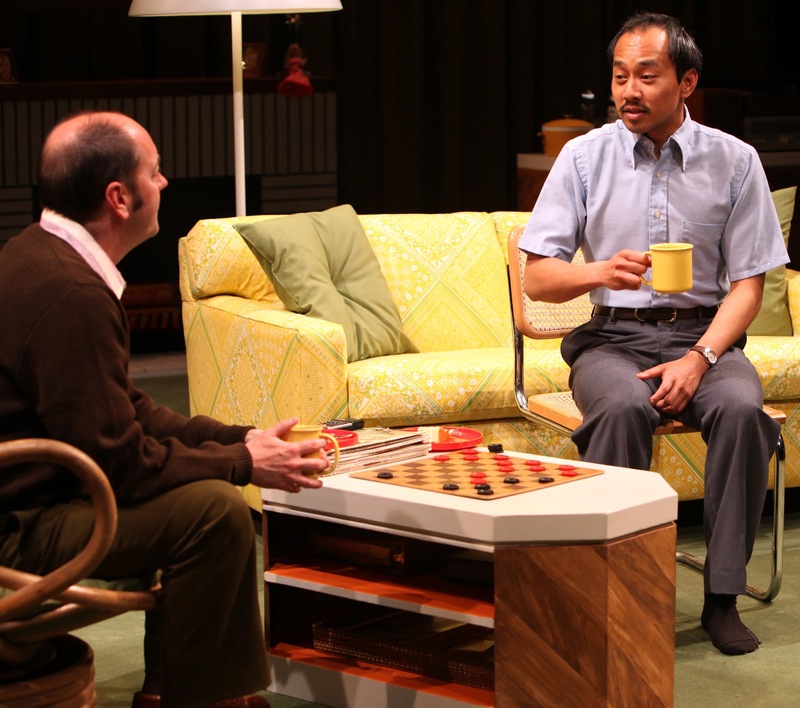 The new roundabout (a gift, by the way, from Berkeley Rep and "Chinglish") makes the set and some sharply executed scene changes possible. The production is a treat to watch.